Arkham is a city under the constant threat of cosmic terror. Dark forces work behind the scenes to undermine the fabric of reality. One has the sense that if Arkham were to fall, it may spell the end of everything. But darkness has ways of being seen. The Ring of Shadows has been found, or maybe wanted to be found, at this critical hour. It's up to the citizens of the Miskatonic Valley to work together to wield its awful power to stop the end before it begins. 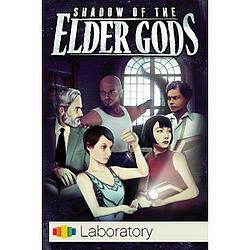 In Shadow of the Elder Gods, 1-4 players take on the roles of citizens of Arkham who work together to prevent cosmic horrors from unraveling reality. Shadow focuses on dealing with the consequences of dark forces conspiring against players, rather than combat. Players take turns spending actions to travel the streets of Arkham researching Knowledge, hiring Muscle, collecting Assets, and dealing with Threats. Each game revolves around an inevitable danger to Arkham which is represented by the Threat Deck, a constructed deck of cards which players must survive in order to banish the Elder Threat and win the game. Each threat card features an Arkham face and a Shadow face. The Arkham faces represents the visible manifestations of the unseemly things found on the Shadow faces of the cards. Whenever the player with the Threat Start Marker begins their turn, a Threat token is placed on the current Threat Card and the indicated damage is dealt to players or locations. The first/last card represents the unique Elder Threat which players must contend with in order to win. The player who possesses the Ring of Shadows is able to view the Shadow side of the Threat Deck and deal with the Threat at hand by using what resources they have, but they expose themselves and others to harm in the process. If players manage to survive their final encounter with the Elder Threat in the shadows, they unceremoniously save the world from incomprehensible danger. But such is the way in Shadow of the Elder Gods.